Under the current Liberal government, multinationals and millionaires aren’t paying their fair share of tax. Labor, however, has announced tax policies that will make the tax system fairer. Is your roster being changed? Do you have a roster reset approaching? Are you worried you’ll be given hours outside of your availability or that the changes will leave you financially disadvantaged? Australians are not getting a fair go. The rules are broken. On 18 May, 2019 we need to change the government to change the rules. Following a historic campaign by Noni B workers to stand together and oppose cuts to their permanent part-time hours, we are excited to share some good news. 'Better the balance and better the world' is the 2019 theme for International Women’s Day (IWD) being celebrated 8 March 2019. Pictured from left to right: Lyn Wiebe, Barbara Nebart, Sally McDonald. When Frank applied for a store transfer, he never thought he’d have to fight just to protect his entitlements or that he’d need the support of his union. Can My Contract Hours Be Changed? The short answer is no. Management can not change your contracted hours without your approval. This year many retail and fast food employees will be working on Australia Day (Saturday) for no extra compensation or penalty rates. Woolworths workers across the country will receive improved pay and conditions after the Fair Work Commission today approved their new enterprise agreement. This year, Australia Day falls on Saturday, 26 January. However, the Australia Day public holiday may be observed on Monday, 28 January depending on your Agreement. In accordance with the Fair Work (Registered Organisations) Act 2009, the Officer & Related Party Disclosure Statement is available. Members at Liquorland, Salamander Bay were having difficulties getting their concerns heard regarding some serious OHS issues. So they banded together and approached the SDA for help. Pictured from left to right: Ryan, Terriann and Sean. Woolies workers win back Christmas! Last week we told you about Woolworth’s shocking application to have its employees work on Christmas Day. We’ve got an update – the application was REJECTED! Rewards programs have been with us for years in fast food chains and supermarkets. Think toys with a kid’s meal, rewards cards and those ‘free’ samples or gifts you receive after spending a certain amount in store. The SDA recently made a submission to the Senate Inquiry regarding the enforcement of skilled visa arrangements. In particular, the SDA believes the current methods of enforcing proper wages and conditions for overseas workers is grossly inadequate. Kirsty works at Woolworths as an online shopper. She recently had to take several weeks off work when she fell getting her son out of the car and fractured her wrist while protecting her son still in her arms. The festive period is almost upon us, which means that Christmas working rosters are starting to be developed. Casuals around Australia and across a wide variety of industries and occupations are being ripped off, in some cases being paid even less than permanent staff.  The laws and privacy provisions surrounding My Health Records (MHR) will be significantly improved after the My Health Records Amendment (Strengthening Privacy) Bill passed through the Senate this week. SDA member Michelle is a single mum and had been employed as a long term casual employee with a national supermarket chain. The SDA’s ongoing work to ensure women receive equal access to dignity and security in retirement. Great news for Woolies workers - new Agreement overwhelmingly voted up! Following a ballot of Woolworths Supermarket employees, an overwhelming majority have voted yes in favour of the proposed Agreement. 62% of eligible Woolworths Supermarkets employees voted in the ballot and of those an overwhelming 93% voted yes! Donna is an SDA Delegate at Coles. She has represented her team mates as a Union Delegate for 13 years. Donna was recently recognized in the Australian Parliament for her contribution to securing the new Coles Agreement. Bullying in the workplace – What is it? Have you ever felt like you have been picked on by a colleague? Perhaps you’ve been repeatedly criticised, isolated, overworked, teased or insulted by a fellow worker or manager? SDA member Chloe works for a large supermarket chain. Chloe was appointed by her employer to take on extra responsibility at work as temporarily ‘in charge’ for 3 weeks. If you’re one of the 300,000 Australians working in Australia’s fast food industry, there are many things you should know about your employment. This is especially the case if you’re a young worker or new to the workforce. With the backing of his Union, Anthony was able to successfully switch to working day shifts. Anthony works full time as a Baker at a supermarket. Until recently, he was working the very early morning shift. Recently, the SDA was able to recover underpaid wages for a group of night fill workers at a major supermarket who had been not paid correctly. Give us a (loo) break! Toilet breaks are not a luxury, but a basic need. It is a legal requirement of employers to provide toilet breaks. Incidents can happen without warning in any workplace. Employers and employees should be prepared for emergencies. Melissa recently blocked attempts by her employer to reduce her hours. With the backing of her Union, Melissa successfully negotiated a new roster which suited her needs and didn’t lose any hours. Melissa works part time at a leading retail store. Mark is a Delegate at Coles Cessnock. He has been a member for almost five years and a Delegate for four years. SDA member Sandy recently slipped in her bathroom and dislocated her finger. Luckily for Sandy, all financial SDA members are covered by our accident insurance policy. Patricia recently secured a permanent part-time job with the support of her Union, the SDA. Patricia had been working at a supermarket on a casual basis for 18 months. She had worked regular hours, and she wanted job security and permanent hours. Together with her Union, SDA member Christelle recently secured improved safety in her workplace. Unfortunately bullying and harassment is still common in the workplace. This could be because incidences often go unreported or are not resolved, as each person has a different perception of what ‘harassment’ and ‘bullying’ is. What is Long Service Leave and who is entitled to it? Long Service Leave (LSL) is leave granted to any employee whether they are full time, part-time or casual for 10 years of continuous service to an employer. Nicole is one of three fantastic Delegates at Woolworths Mount Hutton. She has been a union member for almost three years and a Delegate for almost two years. With Queensland, Western Australia, Coles and Big W stores nationwide banning the use of single use plastic bags on 1 July, the SDA is reminding customers to be prepared and that there’s no excuse for abusive behaviour to retail staff. Perhaps you’ve found another job, are ready to retire, have won the lottery or you just can’t do it anymore. Whatever the reason, you have rights when it comes to resigning. However you also have obligations. Workers at Stockland Green Hills will once again be able to access free, safe parking at the centre, with the SDA, the Union for workers in retail, fast food and warehousing, and Stockland reaching an in-principle agreement. On Wednesday 27 June and Thursday 28 June the SDA will hold a pop-up booth at Lake Haven Centre. The union representing retail workers welcomes Woolworths’ decision to phase out single use plastic bags as of today, but reminds shoppers to remain respectful as part of it’s “Don’t Bag Retail Staff” campaign. A ban on free single use plastic bags will be introduced in some states and select stores across Australia starting from June 2018. Customers will be required to either bring their own bags or purchase a reusable bag. 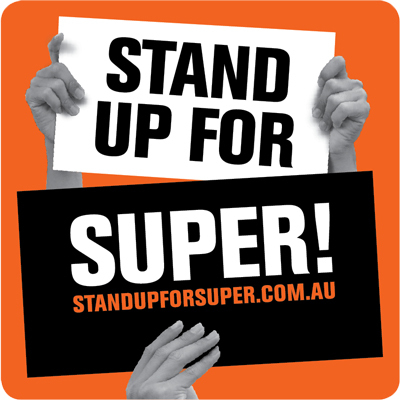 Put simply, your superannuation fund is your retirement savings fund. Dressing and presenting yourself appropriately for work is not a choice, it’s a legal obligation. But what must an employee do to meet appropriate dress and presentation standards for work? It was the collective voice and support of his union that helped SDA member Kon stand up and fight against a roster change at work recently. Kon has worked for a supermarket chain for some 17 years. Since last week, the workers’ fight to restore free and safe staff parking at Stockland Green Hills has gathered momentum. Over 1,000 workers, tenants, customers, local residents and surrounding businesses have already signed the petition. Joanne White works at McDonalds Heatherbrae. She has been a member of the SDA for four years and recently became a Union Delegate. Here’s what she had to say about the role of Delegate, and why she became one. Injuries can occur at any time outside of work. We live in a fast-paced world. People are increasingly time poor and stressed… and at times just plain rude. SDA Union members and Officials recently worked together to improve several safety issues arising from construction works at Westfield Kotara. Members had identified excessive noise and dust issues during trading hours. Katherine Hill is our Delegate at Kmart Bateau Bay. She has been a member of the SDA for more than seven years. We asked Katherine about her role as a Delegate. You’ve got a new job! Congratulations! Tell your current employer you are leaving! About one in five Australians will experience a mental illness, and most of us will experience a mental health problem at some time in our lives, according to the Australian Government Department of Health. Please click here to view the response to the Australian Electoral Commission. Starting your first job can be an exciting time. However, it can also be a somewhat nerve-wracking. If you are offered a redundancy at work, the first thing you should do is check with the SDA to ensure you are being offered a genuine redundancy. Almost one in five Australians reported living with a disability (18.3% or 4.3 million people) (ABS, October 2016). There may be persons with disabilities working in your workplace or you may yourself have a disability. The post-election report is available to view here. Recently one of our members contacted us about a travel expense claim her employer was refusing to pay. Alison, an employee of a petrol station chain, had submitted a travel claim for several shifts she had worked at another site over Christmas. Most employees will be required to undertake workplace training to ensure they have the right skills and knowledge to perform their job. You should receive regular payslips from your employer. Be sure to keep them! A roster is a timetable that shows the days and times employees are required to work. It is important that you know your rights when it comes to rosters and roster changes. At times during your career you may be asked to temporarily undertake a higher position than your usual role, be it for a couple of hours during your shift, or to cover for an employee on leave. Belinda is our Delegate at Woolworths Toronto. She has been a Union member for more than 10 years and a Delegate for four years. We asked her some questions about her role as a Delegate. Emma, an employee of a major supermarket and an SDA member, commenced her maternity leave a few weeks before her baby was due. Bosses are increasingly using force or coercion so that they can attend doctor’s appointments with sick or injured employees. An employer may request a counselling session with a worker where their performance or conduct has been unsatisfactory. The SDA is currently seeking to secure significant improvements for part time workers in the Fast Food Industry Award (FFIA) in a case before the FWC as part of its 4-yearly review of modern awards. Forklifts are used in many workplaces to lift, stack and transfer loads. Unfortunately, they continue to cause workplace deaths and injuries resulting in substantial financial and human costs. Recently, the SDA was contacted by members at a supermarket. The ‘paid meal break’ clause in the store had been overlooked by the employer. Brenda is our Delegate at Coles Fletcher. She has been an SDA member for three years and a Delegate since April 2015. I’m casual, can my hours be cut? As a casual employee, your hours can be cut. However, your employer must notify you prior to your shift that you are not required to work. Workplace change must be accompanied by policies which put people first. Workers have overwhelmingly approved a new Dominos-SDA enterprise bargaining agreement which locks in full penalty rates, improved conditions and provides access to higher guaranteed hours for part time workers. Coles workers will this week review a new SDA-Coles enterprise bargaining agreement which protects take home pay, improves penalty rates, secures hard won SDA conditions and ensures pay rises for every worker. As an employee is it vital that you take proper rest breaks and meal breaks as per your Enterprise Agreement or Award. SDA member Linda was considering resigning after she had been stood down from her retail role pending a request for medical information relating to pre-existing personal condition. Simply put, a hazard is anything (including work practices or procedures) that has the potential to harm the health and safety of a person. Some hazards are more likely to be present in some workplaces than others. At least a third of Australia’s high school students aged 15 years and above work in paid employment, the majority within the retail and fast food industries. Struggling with work while pregnant? When Emalee, a worker at a large supermarket chain, began finding some of her duties difficult to perform due to her being pregnant, she assumed she would have to leave work. 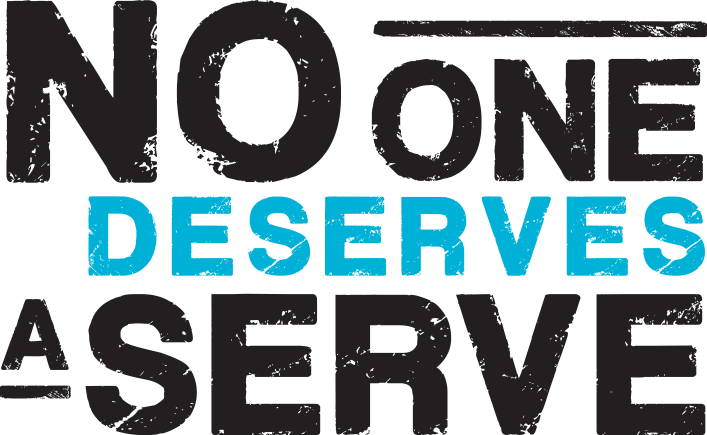 The SDA, the union for workers in retail, fast food and warehousing has launched a major national campaign ‘No One Deserves a Serve’ to stop the abuse and violence towards retail and fast food workers by customers this Christmas. On the back of the NSW Government’s egregious cuts to workers compensation, changes to motor accidents claims took effect from 7 December 2017. The SDA has been working hard to ensure that ALDI workers get a say about their pay and conditions set out in agreements. Rather spend Boxing Day with your family and friends? SDA member Sherin, an employee of a national supermarket chain, covered a relief role in the freezer for a colleague and months later, wondered if she had been entitled to a freezer allowance. SDA National Secretary Gerard Dwyer expressed deep disappointment at the news that up to 1,000 retail workers across the Specialty Fashion Group may lose their jobs as the company decided to close over 300 stores to 2020. When Simone, an employee of a national discount department store, was rostered on for an early morning shift she wasn’t able to work, she went to her Union delegate. A new Priceline Agreement has been voted up by a majority of employees and approved by the Fair Work Commission, securing improved pay and conditions for workers. As a casual worker you are employed on a shift-to-shift basis, and generally have no certainty of ongoing work. Recently one of our delegates contacted us about a roster change made by their store manager which would affect two members. Being an SDA member is the best way to secure a better environment in your workplace. As an SDA member you’ll help win better pay and conditions for workers through collective bargaining with your employer. Recently one of our members returned to work after taking 8 months’ extended leave due to a non-work related injury. Prior to her return, Natalie, an employee of a major supermarket, touched base with the store to discuss her return date. Here’s what Brendan (pictured left) has to say about his role as SDA Delegate. Have you been injured? Read this. Lucky for him, he is an SDA member. Rodger was recently injured in a soccer game and required a knee reconstruction. He missed out on 6 weeks of work and can now only work if his duties do not require he twists his body. Are you on paid parental leave? An SDA member recently faced an issue where she had begun her paid parental leave and was not being paid correctly. Delegate(s) of the month are… dynamic duo Liz Bass and Rowena McNeil from Coles Wyong. Have you ever been flexed up to a management role when your company needed you? Did you know you should be paid for any additional duties you take on? Coles and the SDA have held meetings over the past two days as negotiations for a new Coles Supermarkets Agreement continues. Living in a country like Australia we can often forget that, in 2017, women still don't enjoy full equality to our male counterparts. Are you on Workers Compensation? In its article ‘Pizza driver aims to deliver for Domino's underpaid workers’ (20/08 - The Age online) Fairfax purposely omits key facts relating to the SDA’s handling of the Domino’s Pizza Agreement covering delivery drivers. Staff Shortages A Problem In Your Workplace? The SDA know that staff shortages can be very upsetting and stressful for our members. The SDA takes workplace stress very seriously as it is a health and safety issue. Meetings between the SDA and Coles have continued over the past two days as part of negotiations for a new Coles Supermarkets Agreement. Sick of unlawful workplace notices? Have you ever seen a notice such as this in your workplace? Not only is it incorrect but it is unlawful. An SDA Delegate intervened today in a major supermarket on the NSW Central Coast to have this notice removed. This week, during Safety Demands Action Week, SDA Union Delegates and Organisers will be out in stores talking to workers about health and safety in their store. Balancing pregnancy with work can be challenging for working women but with improved communication and understanding of pregnancy rights the SDA has been able to secure better outcomes for its pregnant members. All employees are entitled to time off for personal/carer’s leave. Personal/carer’s leave covers both sick leave and carer’s leave. The SDA and Coles have met over the last two days continuing negotiations for a new Coles Supermarkets Agreement. Burns to employees in the workplace can occur through many means; hot surfaces, chemicals, cooking oils, steam, radiant heat, fire, hot water etc. Rising to the challenge is just one of the qualities we recognize in someone when choosing Delegates and Jo has done this in spades over and again this year. The SDA and Coles met yesterday as part of negotiations for a new Coles Supermarkets Agreement. Progress was made on improved tea breaks and new part-time clauses. Back pay win for Brittany! How would you feel if you were on annual leave and came back to no job? Brittany had only worked for Subway for four months when she was terminated, as she was still in her probationary period, she had no unfair dismissal rights. David Jones has advised the SDA that it is revising it’s “Wear What You Sell” preferred dress policy. From the end of July 2017, Intimate Apparel, Shoes & Accessories and Childrenswear will revert to the “Black Out” preferred dress. Great news for REST members as REST credits 11.07% this financial year! In good news for casual workers, unions have won an important case to help secure better rights for casual workers. Over the past two days the SDA has met with Coles as part of negotiations for a new Coles Agreement. Yesterday the Company provided their opening position and today we responded with our list of claims. You can find our list here. Today the SDA met with Coles to begin negotiations for a new Coles Agreement and the Company provided their opening position. Tomorrow, we’ll be taking our list of claims to the Company. The SDA, the Union for Workers in Retail, Fast Food & Warehousing is deeply disappointed by the Fair Work Commission’s ruling not to include paid Family and Domestic Violence Leave in Modern Awards. Change Someone's Life - Donate Blood! The Union has decided to increase its membership subscriptions effective on and from 1 July 2017. The SDA, as your representative, is now negotiating with Coles for a new Coles Agreement. Your Coles Agreement sets out your pay and conditions and we will be working hard to secure fair and decent wages and conditions for all Coles workers. Are there cameras at your workplace? Do you understand your legal rights at work when it comes to surveillance? Mackenzie is a proud Union member. He joined the Shop Distributive and Allied Employees’ Association Newcastle & Northern Branch (SDA), immediately after starting work at McDonalds in January 2012. SDA members often ask whether 'carton counts' or ‘scan rates’ are enforceable and whether they can be disciplined or even warned for not reaching targets set by management. Christina Lowe is our May Delegate of the Month. Christina has been a union member for almost 3 years and a Delegate for 7 months. Christina was keen to share her thoughts about her role as a Delegate. The Fair Work Commission has handed down the Annual Wage Case, which determines the annual pay rise for workers covered by Modern Awards, writes David Bliss, Assistant Secretary. Have you injured yourself outside of work? Allex injured himself on a jumping castle. Last night’s “trickle down” federal budget is another budget for the 1%. We need a budget for the 99%. Quite simply, "It's just about being fair." Meet our active 'delegate of the month' the bright, vivacious and outgoing Anita Briggs from Woolworths Lake Haven! Anita has been a SDA member for 9 years and a Union Delegate for 8 years. Being able to make a complaint or inquiry about your employment is a workplace right! "I want to make a complaint about my working conditions but…. Yesterday, the SDA applied to raise the base rate of pay for retail, fast food and pharmacy workers covered by Awards by 10% in addition to the $45 increase sought by the ACTU. The senate has acted to protect the take-home pay of hundreds of thousands of hard-working but low paid people in Australia. Now the legislation and the responsibility to protect working people pass to the lower house. HANDS UP IF YOU HAVE A SUGAR DADDY? Check out this morning’s astonishing radio interview with Employment Minister Michaelia Cash. The ACTU is asking the Fair Work Commission (FWC) for a $45 a week (6.7%) increase in the national minimum wage. The Union strongly opposes the continuation of the Boxing Day trading trial and supports five (5) restricted trading days, specifically Good Friday, Easter Sunday, Anzac Day, Christmas Day and Boxing Day. We already knew that Michaelia Cash was an abysmal IR Minister. Now we can confirm she would make an equally poor green grocer because Michaelia just keeps comparing apples with oranges. Harry Fuller is our March Delegate of the Month. He has been a Union member for 7 years and a Delegate for 1 year and 9 months. Australian women need to join their union now more than ever writes SDA Newcastle & Northern Branch Secretary Barbara Nebart. The union movement has been at the forefront of women’s rights in Australia since the beginning. The Fair Work Commission’s decision to cut Sunday and public holiday penalty rates means that retail and fast food workers will lose out on more than $1 billion each year while not creating a single extra job. Hi, my name is Peter Cooper and I'm excited to introduce myself as the new Organiser of the SDA for the Hunter Valley area. I am excited to take on this role and I am keen to get started in the area, assisting our members. THINK before you post, like, share, send, tweet, re-tweet, snap-chat or instagram! Occupational Health and Safety is a major issue facing Australian workplaces and unions. It’s important that you know what your rights are when it comes to rosters and roster changes. The SDA often receives calls from members who are considering a proposed roster change put forward by their company. Breaks are not optional extras. They must be taken and cannot be withdrawn by your employer. It’s very important to take your breaks when they fall due because they are designed to give you a rest. Could you survive working in the summer in the fast food industry with no air-conditioning? Are you due Long Service Leave? Quite often employees are unsure of their rights around Long Service Leave and when it can be taken. Rebecca Holt is our January Delegate of the Month. Rebecca works in Woolworths Newcastle West. She has been a Union member for 12 years and a Delegate for 3 years. The SDA, the union representing retail, fast food and warehouse workers, has won a victory for H&M workers after successfully opposing an unfair enterprise agreement in the Fair Work Commission (FWC). Snowboarding Accident? We've got you covered! Your employer is obliged to ensure that your workplace is safe (as far as reasonably practicable), so if you experience or are aware of any problems which create risks to your health and safety at work, you need to report them. Diane Bickerstaff and Nicole Ferris are Union Delegates at Coles Lake Haven. Narisa works for a national retailer. In 2015, the company trained her as a corset fitter. In 2016, she was trained in prosthesis fitting. As this training is not standard training, Narisa was unsure if she should be paid for higher duties. ‘Post-truth’ is the Oxford Dictionary’s word of the year. Have you ever broken or fractured a bone or sustained other injuries at home; playing sports, out and about with family and friends or on holidays? Harassment or office banter - where do you draw the line? Earlier this month the SDA Newcastle Branch participated in a Young Workers Conference. During the conference a report was released which found about half of young workers have experienced bullying or harassment on the job. You’re working full-time in a job you enjoy and your boss approaches you one day and directs you to go part-time. What would you do? That’s the dilemma which faced Jack last week. Our member, Randall Connell, works at Officeworks and recently noticed that he had not been correctly paid the higher duties rate and first aid allowance in accordance with his Enterprise Agreement. Can you afford to be $17,000 worse off? Your rights, entitlements and wages at work had been hard fought by unions in Australia for over 100 years. Australian politicians like to pretend the tax debate is complex and we should leave it up to so-called experts (especially former successful businessmen) because apparently we’re all a bit simple, but really it is quite simple. A decent retirement which provides all Australians with a comfortable standard of living in retirement is integral to a fair and just society. Public services are the cornerstone of a fair community but in the last 3 years the Abbott / Turnbull Government has cut over 18,000 public sector jobs. These deep cuts have had an impact on almost every member of the community. More than any other single issue, this election will be a referendum on the future of Medicare. There’s just five more sleeps until the election. Thank goodness! Five more days of politicians ambling through shopping centres, handing out at railway stations, wearing hi-vis, kissing babies and (now officially) launching their campaigns. The Fair Work Commission has awarded a part time cleaner $9187.20 in compensation after he was fired for having a cup of coffee on the job. The Fair Work Commission (FWC) has handed down its annual minimum wage ruling today. The FWC heard evidence and submissions from unions, employer associations and other interested parties during an exhaustive process which commenced late last year. In breaking news, the Fair Work Commission has just ruled that the enterprise agreement that 91 per cent of you endorsed, should remain in place, confirming that the vast majority of Coles workers are better off. Nicole Cox fractured her ankle whilst mowing her lawn when her foot rolled into a divot. During a Union Official’s visit to Nicole store, Nicole was advised she could claim through the Union’s Accident Insurance. She received a payout of $600. The Australian Electoral Commission (AEC) is urging voters to check their enrolment details before the upcoming federal election campaign. The electoral rolls will close on May 23rd, ahead of the July 2 poll. 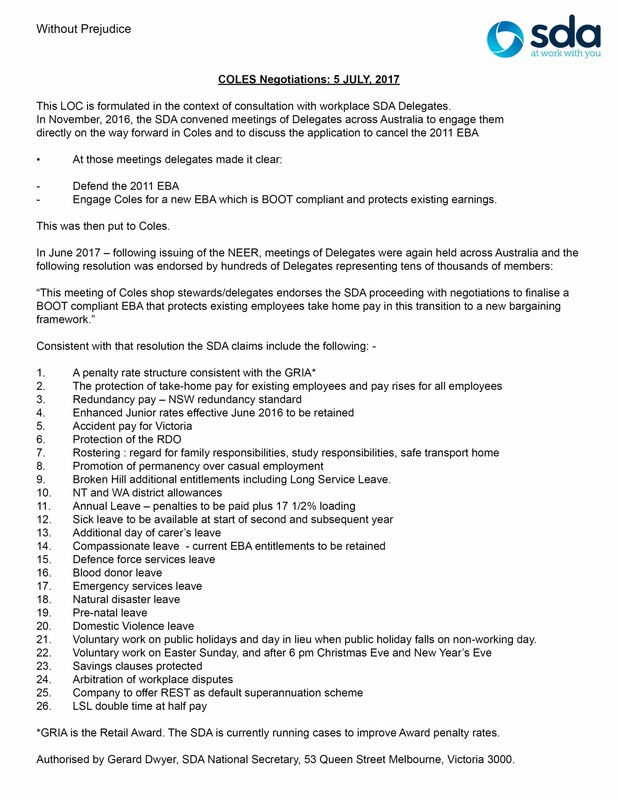 Safety is union business and the SDA - the union for retail, fast-food and warehouse workers - makes no apologies for that. Catherine Sparke contacted the SDA after working for 10 years for an international fast food chain. Congratulations to Fiona Madafiglio who has won this issue of The Distributive Worker’s ‘Barbara’s Brainteasers’. A 20 year old Melbourne woman, Kahlani Pyrah, has launched Federal Court action against fast-food company Grill‘d. A sixteen year old KFC worker in Geelong suffered horrific burns to his face and body in a workplace accident on Friday night. Tyson Grieg, 16, an experienced cook, worked for KFC for 2 years when the incident occurred.